Englishman Antony Peebles is not only a brilliant pianist, he is also a consummate entertainer. We welcome his return to open our season with a colourful programme of Beethoven (Les Adieux Sonata), Chopin (Scherzo No 3), Rachmaninov (the Etude-Tableau in Eb minor and two Preludes), and several of Liszt's transcriptions of Schubert songs. To end on a light-hearted note Antony Peebles will play his own Suite on Loewe's My Fair Lady. The NZSO's acclaimed oboist Robert Orr joins the Iota Trio (violinist Haihong Liu, violist Lyndsay Mountfort and cellist Eleanor Carter) to present this innovative and attractive concert. Highlights will be Mozart's glorious Oboe Quartet and a real novelty - the Cor Anglais Quartet by Jean Françaix, a French composer whose music abounds with charm and wit. 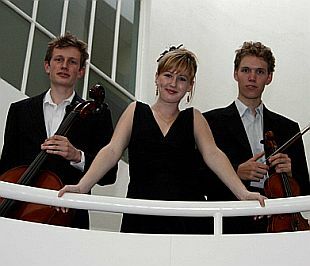 They will also play two Serenades for String Trio, one by Beethoven and the other by the Hungarian composer Dohnanyi. 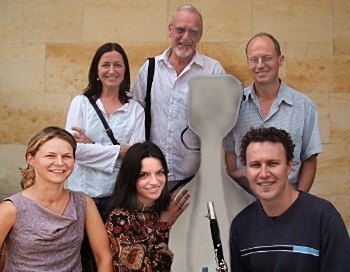 Our most popular group returns, with pianist Emma Sayers and clarinettist Philip Green joining Donald Armstrong and friends to perform some of the most beautiful music ever written. In a programme specially chosen to mark Anzac weekend, Prokofiev's haunting Overture on Hebrew Themes and Samuel Barber's famous Adagio for Strings add a piquant note, while the major works are Mozart's sublime Clarinet Quintet and Schumann's tuneful Piano Quintet. From Canterbury University's Music Faculty comes one of the finest musicians to move to New Zealand in recent years - the talented and versatile German cellist Edith Salzmann, who will be joined for this concert by the much acclaimed NZ/Canadian pianist Diedre Irons. This dynamic partnership will bring us music spanning more than 300 years: a Bach Sonata, Beethoven's third Cello Sonata, Debussy’s dramatic Sonata for Cello and Piano, and that perennial romantic favourite, the Cesar Franck Sonata. 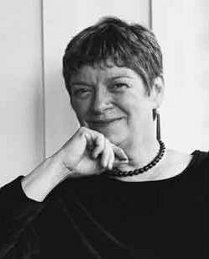 We are delighted to welcome Diedre Irons in place of pianist Gao Ping who is no longer available for this concert. This irresistible concert is the realisation of two long-held dreams: to lure former NZSO Concertmaster Wilma Smith back from Australia to play for us, and to hear pianist Michael Houstoun in a chamber ensemble. 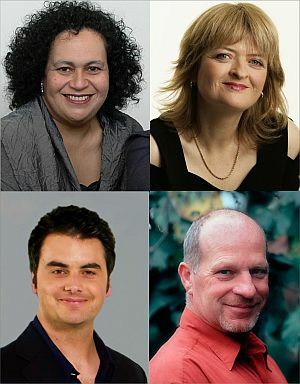 Wilma and Michael have invited two other first class musicians to join them: Gillian Ansell (violist with the NZ String Quartet) and Ashley Brown (NZ Trio cellist), and they have selected some of their favourite music to play. Be ready for a veritable feast of the most luscious masterpieces in the piano quartet repertoire by Fauré (Opus 15) and Brahms (Opus 26), and be prepared to be astonished and moved by the power of Schnittke's brief one movement Quartet. Kapiti's outstanding young violinist Blythe Press returns from Austria for a Chamber Music New Zealand tour with pianist Amber Rainey and cellist Paul van Houtte. These three talented young musicians will delight us with two evocative trios by Turina, followed by Island Songs, one of the most popular works of New Zealand composer John Psathas. Dvorak's Piano Trio in F Minor takes pride of place as the major work on the programme. Unfortunately, Amber Rainey is for health reasons now unable to come to Waikanae for this concert and will be replaced by Sarah Watkins. Amber has been playing in previous concerts, and will be playing in the remainder of their CMNZ tour. "SPECIAL SATURDAY AFTERNOON CELEBRITY CONCERT"
We proudly present Singapore's premier chamber ensemble together with New Zealand's most celebrated young pianist. 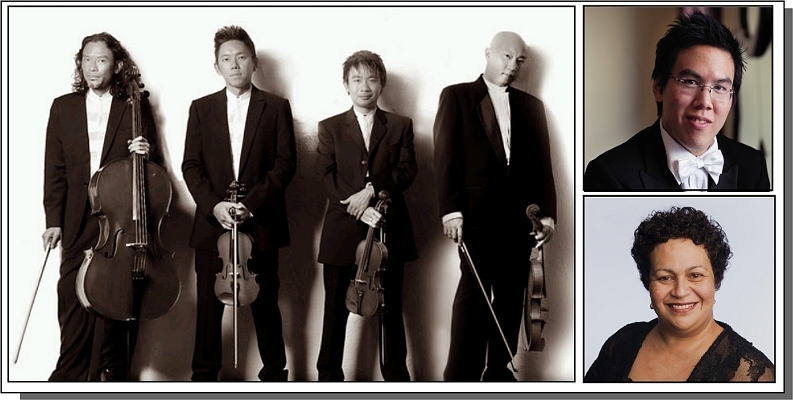 Formed in 1992, the T'ang Quartet (violinists Ng Yu-Ying and Ang Chek Meng, violist Han Oh and cellist Leslie Tan) have won numerous awards and accolades and have earned an international reputation for dynamic presentation, outstanding ensemble and tonal blend. 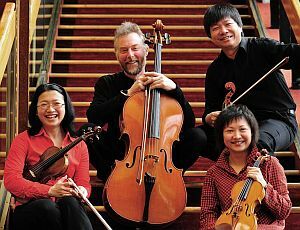 This concert offers a chance to hear the Quartet and John Chen separately in an all-Ravel first half consisting of the colourful String Quartet and Gaspard de la Nuit, Ravel's most technically demanding piano work. In the second half the musicians will join forces in a performance of Dvorák's melodious Piano Quintet. 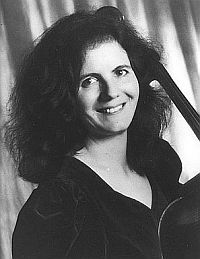 Unfortunately, Ng Yu-Ying is now unable to come on this tour for health reasons and will be replaced by acclaimed violinist Wilma Smith. 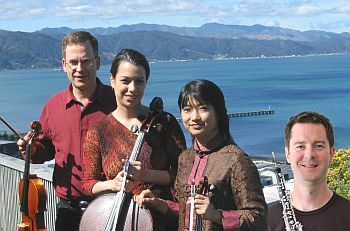 The T'ang Quartet appear in Waikanae courtesy of the Christchurch Arts Festival. Major funding for their New Zealand visit has been provided by the National Arts Council of Singapore. 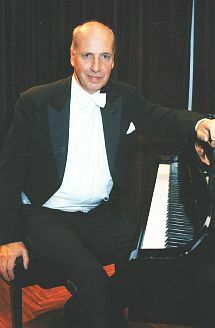 One of the most successful of overseas based New Zealand musicians, Stephen de Pledge impressed when he played for us in 2004. 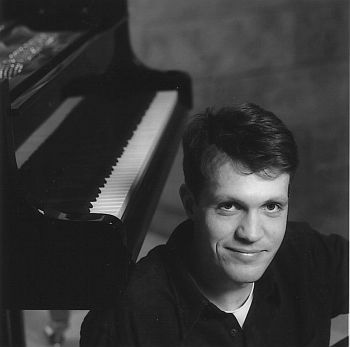 Once again touring for Chamber Music New Zealand, he will tempt us with a wide-ranging array of piano treats including Beethoven's justly famous Pathétique Sonata, Debussy's Images Book 1, the Opus 78 Rhapsodies by Brahms, and Prokofiev's dramatic and formidably difficult Seventh Sonata. How could we resist such a delightful offering from this popular group led by violinist Haihong Liu? The concert opens with one of Haydn's most charming string quartets, Opus 77 No 2, followed by Shostakovich's brief and emotional Seventh Quartet and then Puccini's beguiling miniature, Crisantemi. After the interval we return to Russia for that great Romantic favourite, Borodin's Quartet No 2. Joining Haihong for this concert will be Beiyi Xue (violin), Zhongxian Jin (viola) and Robert Ibell (cello). Sunday 7 June and Sunday 15 November. "These pages were last updated on October 16th, 2009"
The contents of this site are being continually updated. Please "refresh" your browser regularly (F5 key) to see these changes.